The large buiding on the right was a pork butchers for many years & this is the rear of the premises . There was a huge pig on the gable end as an advert which was visible from some parts of Water Street . This boat was owned by Thomas Holden, son of Walter Holden, coal factor and canal carrier,otherwise known as Old Growler. This nickname was attributed to his fondness for the pork pies produced by the conveniently situated butcher. The pork butchers was owned by Henry C.C. Holmes (my husband's g.grandad) in 1901 (poss earlier). His son Arthur then took it over. 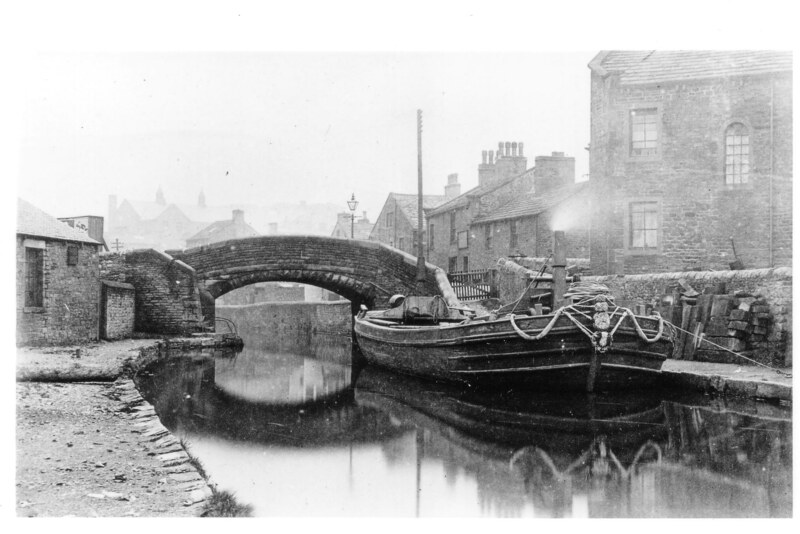 This photo can be dated before 1909, because the adjoining building, just inside the canal wall towpath, has not been erected. It is occupied today by Lotus Petals. By the 40s/50s, both towpaths were all grown over and on the left was blocked off by a fence at the junction with the main canal. The right towpath led back to the Canal Yard (managed by Mr Mayman) with a large horse manure bunker on the way. But how did the barges get further up Springs Canal. You can only gain access to the towpath by those steps - no good for horses?